Charming, highly upgraded home over 2,600 square feet of total finished living space, just a five minute walk to the lake and downtown Oakville. This home is situated on an established, tree lined street just steps from the amenities, yet removed just far enough so as to maintain tranquility. A classic covered porch provides a welcoming entry to this unassumingly lavish home. The solid oak staircase provides a sense of tradition to the open concept main level, while a coat closet and two-piece powder room are conveniently tucked aside. The travertine tiled foyer opens onto gorgeous stained hardwood flooring in a satin finish, which is consistent throughout the dining and living areas. Multiple bay windows with custom silhouette blinds allow for plenty of natural light. The eye is then drawn upwards, to the rod iron chandelier set in a rectangular molded medallion that is the focal point of the dining area, and the intricate waffle ceiling that defines the living area, along with the gas fireplace with ceramic tile hearth and surround and painted wood mantel. Elegant wainscoting and double height crown molding dress the rooms, and mini halogen pot lighting with dimmer feature provide for additional ambiance. 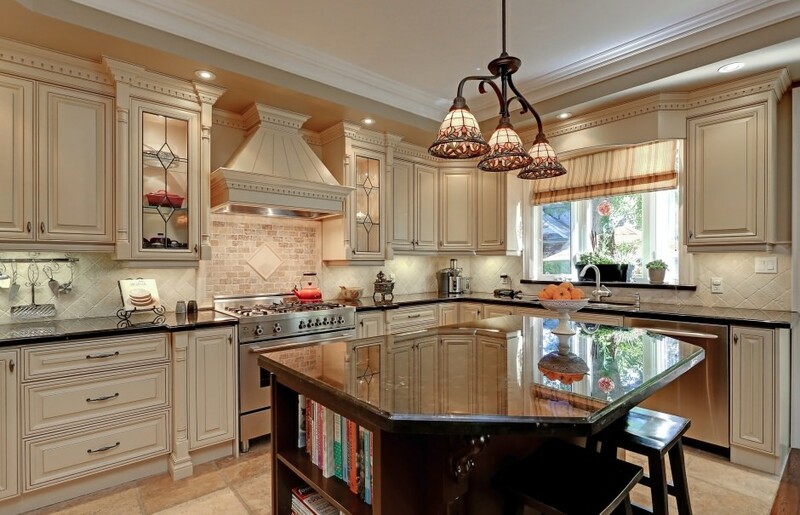 The travertine tiled flooring is again featured in the open concept gourmet kitchen. This space boasts custom cabinetry with accent lighting, granite counter tops, high-end stainless steel appliances, and a large centre island perfect for entertaining. The second level landing is incredibly bright, with two oversized skylights set within the vaulted ceiling. 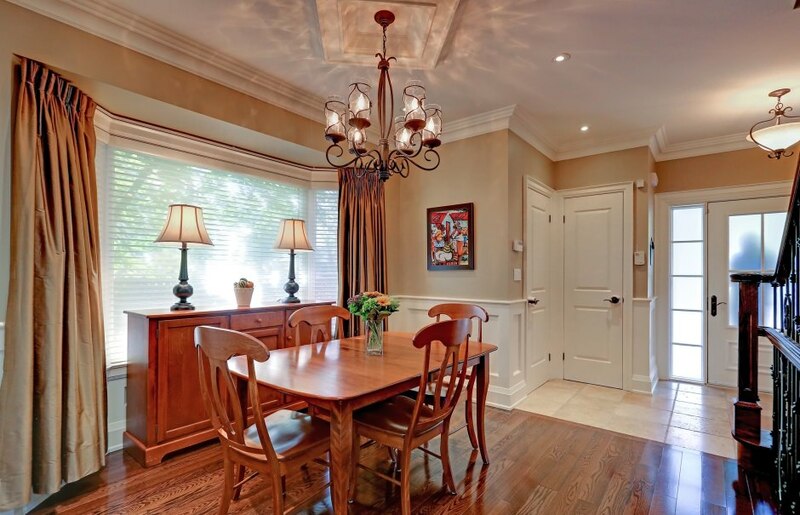 The stained, satin finish hardwood flooring is consistent throughout the entire second level. The master retreat comprises the south side of the second level. A vaulted ceiling and large bay window create a spacious bedroom area, while a frosted glass door with phantom screen opens to a charming Juliette balcony overlooking the rear yard and mature south Oakville trees. The master ensuite is reminiscent of a luxurious spa, with heated travertine tile flooring, a large Jacuzzi tub and separate glass shower, and custom his & her double vanity with marble counter tops. A bay window is well situated above the Jacuzzi tub. A large walk in closet with built in storage complete the space. Two, good sized additional bedrooms boast large windows with California shutters, crown molding, and double closets with interior lighting. The main bath also boasts heated travertine tile flooring, ceramic tile wainscoting with a chair rail detailing, built in vanity with granite counter top, and deep tub/shower combo with modern half glass barrier. 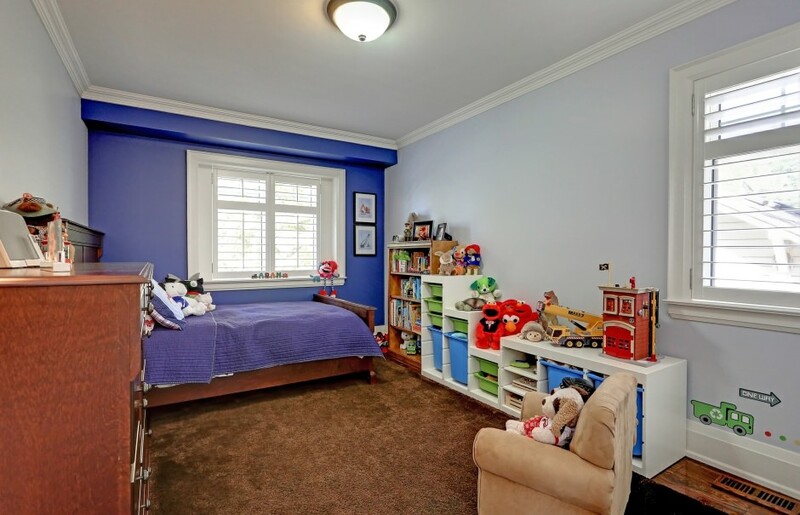 The fully finished lower level provides plenty of additional living space. With its excellent ceiling height, abundance of windows, and heated cork flooring, it is easy to forget that one is below grade. A large family room equipped with a gas fireplace, built in cabinetry, surround sound, and sleek temperature controlled wine fridge make for a desirable place to unwind. A three-piece bathroom is conveniently located, as well as a sizeable laundry room, finished storage room, and supplementary cold storage space. 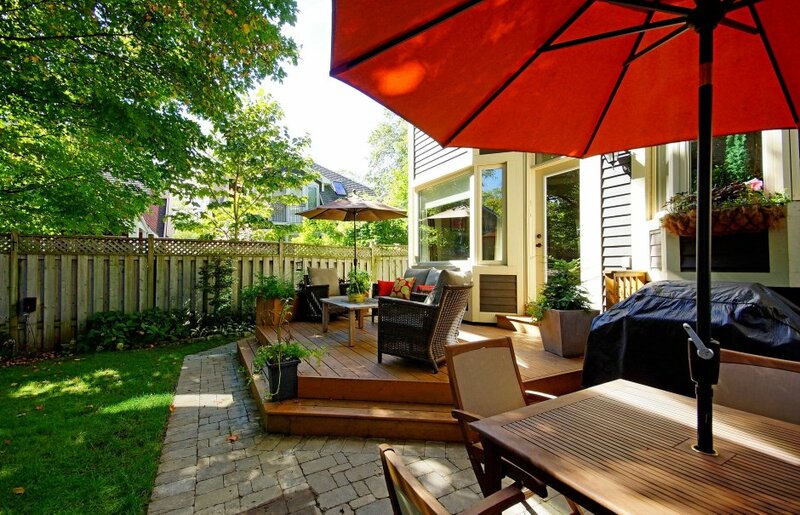 The private rear yard is your peaceful oasis, fully fenced and surrounded by mature trees, while the wood deck and interlocking stone patio delineate ample space for entertaining. 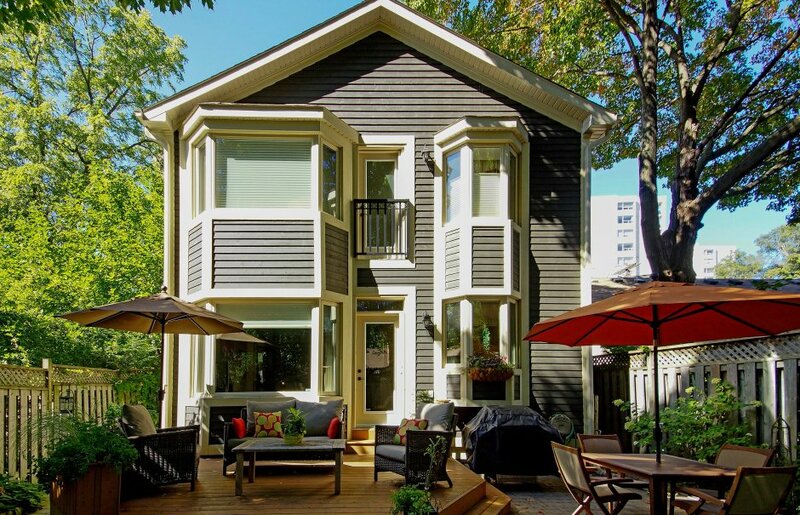 Tranquil setting and prime downtown location, this home truly satisfies the best of both worlds!